What facilitation does for you, your team, and your business. Facilitation. It’s the act of helping to move forward. To ease. To make less difficult. If your business is like most, you’re doing your best to navigate this “VUCA” world we live in . . . a world that is volatile, uncertain, chaotic and ambiguous. A world where existing processes don’t always work, and plans don’t always “pan” out the way you hoped they would. We live in a world comprised of endless combinations of skills, talents, biases, challenges, and personalities; the best solutions aren’t always apparent. It’s time to bring in Joan. When you hire someone to help make your business work better, you want things to get easier. You don’t want another big personality to contend with. Joan is an expert at joining in and assessing your situation. She listens, observes, and sees beyond the obvious to uncover what’s really going on. Joan’s ability to nurture participation from all team members is unsurpassed. She makes everyone feel a part of the process, so there is freedom and emotional safety to contribute. That builds teamwork. Then she helps keep your team on-task and moving in the same direction. So you can set and achieve goals—that deliver desired results. In other words, she creates an experience where team members can embrace the mission, see the vision and then identify what good looks like to work in harmony toward a common goal. As with every aspect of what she does, Joan addresses the needs of your company on an individual level. There’s no one-size-fits-all solution. She customizes her recommendations so you get exactly what you need. If you feel like your team just can’t get over the hump in terms of conflict resolution, shared goals, and effective workflows, contact Joan. She knows how to facilitate the overcoming of obstacles so that you can get a move on. 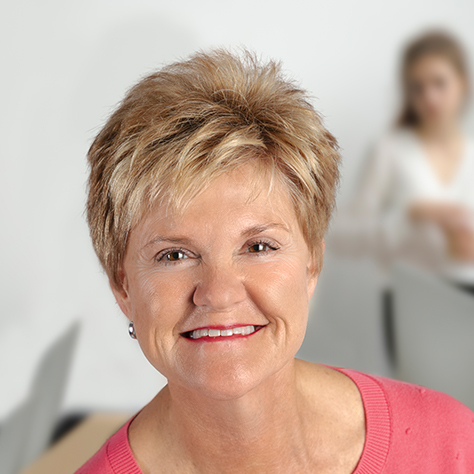 Joan Clark takes a personal and individual approach to facilitation.